Once upon a time Jews wrote the shows…Now it seems they ARE the shows, with revues and plays, some good, some Bad lining up to have the “J” word in the title. The latest pot-pourri - or should that be cholent (google it) – of kosher-themed offerings is Aria Entertainments’ rather charming The Great Jewish American Songbook, which includes many of the 20th century songwriters who composed for Broadway and Hollywood. Note “many”, but significantly, not “all”, with notable omissions on the night including Bernstein, Sondheim, Styne, Kander, Ebb. Anyway – this ensemble is really rather good. Their set list runs in chronological order, kicking off with "the daddy" of the Broadway musical, Jerome Kern and ending up somewhere in the 1960’s with Jerry Bock and Sheldon Harnick’s Fiddler On The Roof. Such was the familiarly of the numbers that the (mainly silver-haired) crowd could barely stop tapping their feet. Jennifer Harding first made audience spines tingle with a thrilling Can’t Help Loving That Man from Show Boat and if Lee Ormsby’s Ol’ Man River wasn’t quite as sensational (Lee, a tip, the “d” in Ol isn’t just silent, it’s non-existent! ), it offered a chance to re-visit one of the biggest songs ever, from Ormsby’s gorgeous baritone. 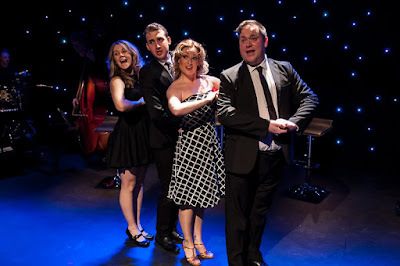 Harding was soon to stun again with a sizzling extract from Gershwin’s Summertime, in a section of the show that illustrated the classy structure of Chris Burgess' book, linking the songs with insightful narrative. The poignancy of the cast telling of Gershwin’s death and then immediately singing They Can’t Take That Away From Me was a link of heartbreaking magnitude. Jessie May who was on top form throughout, went on to deliver the composer’s gorgeous Our Love Is Here To Stay. Burgess’ skill is not just in showcasing the favourites, but also unearthing some rare gems. Grant McConvey made great work of Irving Berlin’s Cohen Owes Me Ninety-Seven Dollars – a number so full of Jewish American humour it could easily have been penned by Tom Lehrer or Mel Brooks. It was Harding and May however who were again to break the hearts of a packed Gatehouse with Berlin’s Suppertime, from the little known show As Thousands Cheer, the song’s harrowing lyrics telling of an African American woman having to tell her kids their father’s been lynched. The second half offered a whirl through first Rodgers and Hart, then Hammerstein with perhaps one of the evening’s rare duds, Oklahoma. The song was written to be sung by a full company – and scaling it down to just four voices left it denuded. Also – whilst much of the narrative was fascinating, some of it, told on this night to a predominantly Jewish audience from a predominantly non-Jewish cast sounded occasionally just a tad patronising. Nothing that can’t be tweaked mind and anyway, what's a review of a Jewish show without at least one complaint! The biggest accolade of the night has to go to Musical Director Neil MacDonald and his unseen Musical Arranger Andy Collyer. The whole gig was a seamless segue of musical excellence, MacDonald’s three piece band capturing the distilled classics perfectly. Whilst its Highgate run is about to end, this delightful evening deserves a (to misquote Tevye) Long Life! There’s wit and wisdom in abundance as well as a respectful acknowledgment of the century’s horrors that so decimated European Jewry. When it comes around again, don’t miss it!